Easy and convenient, our Au Bon Pain gift cards make a great gift for a friend or even for yourself! Au Bon Pain gift cards are redeemable for purchases of food and beverages at participating Au Bon Pain cafés. Similar to a debit card, you can add value online or in cafés. Load $5 - $100 upon purchase and $5 - $150 on subsequent reloads. Your giftcard balance will appear on your café receipt or you can easily check your balance and account activity online or by phone. Au Bon Pain does not charge any fees for the issuance, activation or use of gift cards. Au Bon Pain gift cards do not expire. For additional convenience you can also set auto-reload for a specific amount to be regularly billed to your credit card. You'll receive an email confirmation after each auto-reload. It may take 24-48 hours for reloads or changes in preferences to take place. You may discontinue auto-reload within 24 hours of the next scheduled reload. Once the dollar value is loaded the transaction cannot be reversed. Register your gift card, check your balance and account activity, set up or discontinue auto-reload. Manage your gift card here or call us at 877.728.4100. 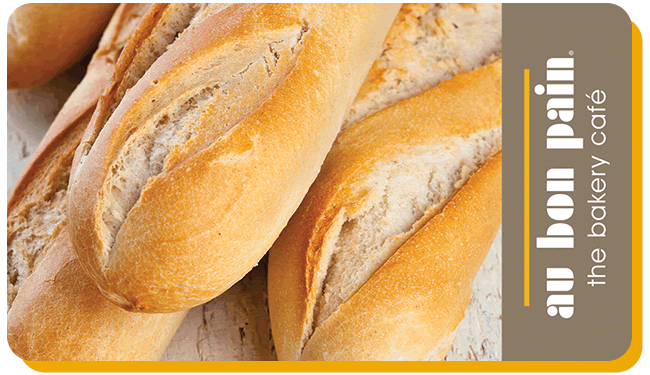 You may also email ABP_Cash@aubonpain.com. Have a question about a specific transaction? Interested in buying gift cards in bulk for your organization? Contact us at storedvaluecards@aubonpain.com or 866.573.8404. By using your Au Bon Pain gift card, you agree to terms and conditions set forth below and on our Terms and Conditions page.